The price of a piece of clothing is not at all indicative of the working conditions of its manufacturer. On top of that, implying (or outright saying) that there is something morally wrong with paying ten dollars for a t-shirt is incredibly classist. The truth is that when brand names charge higher prices for their items, that extra cash usually goes to two places: into the pockets of CEOs and other higher-ups, and into the company's advertising budget. In the wake of the April 24th Bangladesh factory collapse, which is now considered to be the most deadly accident in the history of the garment industry, I've been hearing a lot of people sharing some pretty uneducated and uninformed opinions. I've heard stuff like: "Well, where did you think your ten dollar t-shirt came from?" 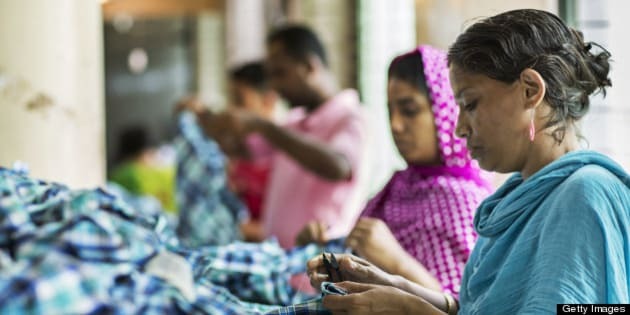 And: "Major clothing brands should refuse to do business with manufacturers in Bangladesh." As well as: "Why do we even make stuff overseas anyway? It's all crap." There are a lot of problems with these types of statements. For one thing, the price of a piece of clothing is not at all indicative of the working conditions of its manufacturer. For another, implying (or outright saying) that there is something morally wrong with paying ten dollars for a t-shirt is incredibly classist. And finally, saying stuff like this shows a serious lack of understanding about how the garment industry works. So let's debunk a few of these myths, shall we? This is not at all true. Spending more money on an item of clothing doesn't guarantee that the factory worker in Bangladesh who made it is earning a higher wage. It doesn't even mean that the quality of the garment is any "better" than something you could buy for half the price. The truth is that when brand names charge higher prices for their items, that extra cash usually goes to two places: into the pockets of CEOs and other higher-ups, and into the company's advertising budget. Even buying clothing with a "Made in Italy" or "Made in the USA" label doesn't guarantee that that piece of clothing was made by people working in decent conditions. In Italy, for example, labelling laws are extremely lax. A product can be almost totally manufactured elsewhere, but so long as it's "finalized" in Italy (adding leather trim, for example, or sewing on buttons) it can be labelled as "Made in Italy." As well, it should be noted that just because something is manufactured in Western Europe or North America doesn't mean that the factory employees who made the item were paid a fare wage -- illegal immigrants are often hired and paid under the table, meaning that employers can pay them whatever they like and the employees believe that they have no recourse for action. In Prato, Italy, Chinese immigrants were found to be working in garment factories for as little as €2 an hour. But even when companies do pay their workers minimum wage, it's often not enough. In many countries, minimum wage is not a living wage, especially if you live in a big city. 2. Our society's desire for cheap clothing is exploitative and unsustainable. People should be willing to pay more money for their clothing. First of all, let's talk about how classist this assumption is. I mean, if you're well off, then sure, you can probably afford to pay more than ten dollars for a t-shirt. But if you're making minimum wage and living below the poverty line, then cheap clothing is the only type of clothing you can afford. Take Toronto, for instance. Ontario's minimum wage is $10.25 an hour, and the average cost to rent a bachelor apartment in Toronto is $840 per month (this figure most likely does not include utilities, phone/internet, or parking). If you're making minimum wage, then you're only bringing home $1,640 monthly before taxes. If you're paying the bare minimum in income taxes (so, no union fees or anything like that), then you'll be taxed $236.38 a month (according to this calculator on a government website), leaving you with $1,403.62. After paying rent, you'll have $563.62. That $563.62 has to pay for everything other than rent: your phone, internet, food, transportation, utilities, clothing. And those are just the basics -- what about entertainment? Things like going out to see a movie, or having a few drinks with friends at a bar? And all that is assuming that you're single, childless and living in a bachelor apartment. Imagine how little would be left if you were the only breadwinner in a family with several dependants. At that point, even a ten dollar t-shirt starts to seem astronomically expensive. 3. Major brands should just stop doing business with manufacturers in Bangladesh. And this would solve what, exactly? It certainly wouldn't improve working conditions in Bangladesh factories. In fact, it would probably lead to a loss of employment opportunities in Bangladesh, meaning that the few companies that still hiring would be able to pay their employees even lower wages if they chose. People would be scrambling and competing for jobs, and would have to accept whatever came their way, no matter how badly it paid. The other thing is that no matter what country those companies are manufacturing their goods in, so long as they are trying to keep their wholesale prices as low as they are, the manufacturers will have to cut corners, pay their workers substandard wages, and skirt safety regulations in order to satisfy the companies' demands. Here's what major brands actually should do: cut CEO salaries. Seriously. In the US, the average multiple of CEO compensation to rank-and-file employee is 204. Yes, you read that correctly. A CEO earns, on average, two hundred and four times what their retail employees earn. And let's not even get into how much more a CEO earns when compared to one of the employees in their overseas factories. How is that even a little bit ok? Imagine how inexpensive clothing could be if we cut CEO wages. Imagine how much we could improve working conditions in countries like Bangladesh if CEO salaries were cut in half? Companies also need to institute frequent, surprise inspections of the factories that manufacture their goods. They need to find ways to ensure that their goods are being made by employees who have fair wages and decent work environments. They need to actually take responsibility for how their business is being operated. 4. Why do we even make stuff overseas? Why not manufacture more stuff in North America/Europe/elsewhere? The truth is that manufacturing clothing in North America and Europe is becoming more and more difficult. It's less expensive to manufacture in Asia for a variety of reasons, and not just because labour is cheaper there. Another important cost factor is that many of the raw materials are now more readily available overseas than they are here. For example, China is the leading grower of cotton in the world, meaning that even if an item of clothing was sewn in Canada, the used would most likely come from overseas. Is there really a difference in how "ethical" your clothing is if the finished product is made here but the raw materials are harvested and processed by underpaid workers overseas? How ethical is it if the water used to grow those raw materials (cotton, for example, is a notoriously water-intensive crop) is partly responsible for major water shortage in China? How can we ever make sure that every person who has somehow contributed to making our clothing is treated fairly? Look. The garment industry is screwed up, and major changes need to happen. Factories need to be unionized, workers need better conditions, and CEO pay needs to be cut. Here at home we need to increase minimum wage to a livable wage. We need to figure out a way to make sure that everyone who participates in the garment industry, whether they're an employee in a retail store, a worker in a factory, or a small child whose water supply is being used to water cotton crops, is getting a fair deal. I don't have all the answers. I'm not sure how we can make any of this happen, or what the world would look like if these changes were to take place. But what I do know is that the way that we live now is not sustainable, not by a long shot. I know that we need more accountability from the companies that make our clothing, and more tools like Good Guide to hep us figure out where to spend our money. We need to make more of an effort to educate ourselves about how and where our goods are made. Most of all, though, I know that the ten dollar t-shirt is not the problem. It's just a symptom of the problem.